Baby Shower Taboo is a version of the much loved Taboo game. Its a perfect ice breaker for the party because it lets everyone dive right into the fun without any awkwardness. Its a very versatile game because it can be played as a team or have individuals compete against each other for points. Prepare the game with as many categories as you like and can even add five or more taboo words if you want to make it harder. However the more categories the longer the game will be. The volume and intensity level for this game is high so be warned!! 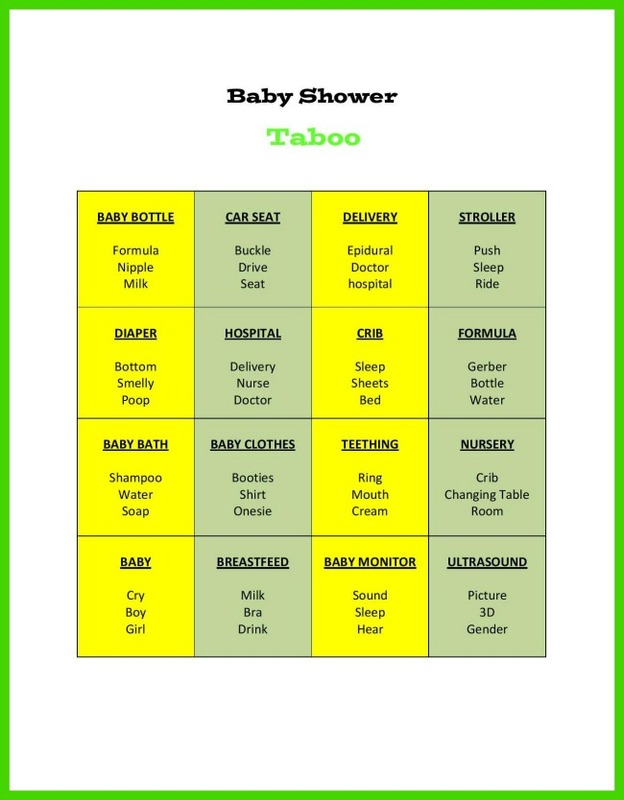 A taboo Game sheet similar to the one in the picture below. Cut out each square to make a game card. Prepare your cards. Index cards or make cards out of regular paper or cardstock, your choice. Another way is make a game sheet similar to the one you see below with categories of baby related items and cut out each square to make a card. There are two ways you can play. In teams or individually. Divide guests into two teams and pick one person from each team to stand in front to read the taboo cards. These 2 persons should hold their card in such a way that the other can see the card clearly to prevent any cheating. After all we want fair play. Each team gets to try and guess the correct answer. Now the aim of the game is to have the team captain call out words or phrase that will help the others guess the word at the top of the card. The trick is that they cannot say any of the words on the card these are the taboo words. If the team guesses correctly within the minute they get a point no point is given if they answer incorrectly or fail to give an answer. After the minute its the other teams chance to get a turn. Play until all the cards are gone or until the game winds down. The team with the most points win. The second way to play is to have mom-to-be or hostess read out the taboo cards and give everyone a minute to try and guess the answer. Someone else keeps track of the time and score and the person that has the most points wins.